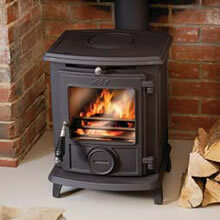 The Little Wenlock Classic SE Stove is the latest addition to the Aga stove range. Specifically designed to burn wood – and to burn it so efficiently as to meet the stringent requirements of the Clean Air Act – the low particulate emissions from the SE means that this product is fully approved to burn wood in smoke control zones (typically associated with urban centres of population). As we live in London we are required to have a “smoke exempt” stove, we both agreed on the Little Wenlock classic SE, what a fantastic little stove it is! it’s so easy to use and heats the room up in no time, build quality is fansastic and the cast really holds the heat well, would have no hesitation reccomending this stove to anyone that wants a hard working, easy to use, fantastic quality stove. I’ve had both open fires and log burners in the past and this one is the cream of the crop. It’s so easy to light, easy to clean and easy on the eye. I am an AGA convert. This is a brilliant little stove, easy to light, gives out great heat, we are really pleased with it. Will definitely recommend it. Having searched for a Smoke Exempt woodstove, we settled on the attractive and traditional Aga Little Wenlock SE and have been very impressed. The installation was straightforward, and the flue & register plate supplied by Fires Online were exactly right for what we needed. Our previously dusty and unused fireplace is now “alive” and providing both warmth and a visual treat for visitors, who are often not used to seeing “real” fires in town. Great little stove, looks the part, well built, kicks out plenty of heat and so easy to use. After spending some time thinking what’s on offer out there we came up wirth this little powerhouse. Compact and efficient. Fantastic little stove well made and a finish to match. Problem now is I’m hooked on the efficency of the ‘burn’ and want a bigger one for the room next door! After extensive research I decided to get rid of our gas fire and install a woodburner. I am extremely satisfied with my Little Wenlock and am just sorry I didn’t do it years ago. I live in a smokeless zone and this little fire ticks all the boxes as far as size and performance goes as well as being quite pleasant to look at. After removing a fairly big and bulky old woodburner from our house during renovation last year we always new we wanted to replace it with a smaller unit but didn’t want to compromise on heat output , and also , we had to satisy the no smoke rule in the area in which lived (the Wirral). After some time searching , we came upon the Little Wenlock Classic SE.At first I was a little apprehensive due to its smaller size than the rest of the units we had looked at but we needn’t have worried ! I have installed this Aga in a kitchen / dining room which has been knocked through into one room and is approximately 5m x 6m (30m2)in area. I have been fuelling the aga with a mixture of seasoned logs and wood offcuts (from a kindly joiner friend) and let me tell you that the heat output from this unit is absolutely amazing , provided you start the unit up correctly with some kindling and a little dry paper it will be burning away in about 5 mins and ready for your first larger chunks of wood and will be roasting in no time. I cannot recommend this unit highly enough as the heat output for such a small unit is quite frankly outstanding. When it comes to cleaning up the next day , the easy to use tray and handle easily slide out and you dispose of the ashes (which there won’t be much of as the wood virtually completely burns away). fantastic little fire. I have it fitted in my conservatory. During the severe winter we have just had it has been a god send as I have let the heat drift around the house by leaving the internal sliding door open. Once the fire had a good bed it was possible to maintain 22 C through out the door stairs of the house. The draw of the fire is a little too strong to maintain the fire over night with all the vents closed ,this could be due to the draw of my flue and the wood that I use. Stoking the fire is very simple once I have dragged the dog from his permanent position on the hearth rug!! Infact if you have a dog and a cat there could be trouble ! Having had a wood burner for years,I decided to buy a new one that would be more efficient.Read all the reviews I could find on this stove and decided to go for it.Love the look of this stove and as it was made by Aga thought it would be a good investment. I went for the smoke exempt version. I have no regrets purchasing this stove,but I do have one very major issue with the way the flue pipe connects to the spigot,unfortunately due to my register plate layout I had to flue it from the back and this is where the major issue arose and someone else has pointed this out.The Tee piece or bend you use to connect to the spigot is a ridiculous design,I spoke to Aga who advised to fit it using cement and rope,which we attempted as soon as we tried to connect the length of flue pipe the Tee piece fell out of the spigot,which we had already predicted would happen.Having spoke to a HETAS engineer he said the only way of securing the Tee piece would be to drill the spigot and Tee piece and fix with self tapping screws,rope and cement,so after a lot of hassle and messing about this is what we had to do.Unfortunately doing this has made the warranty for the stove invalid.I am going to email Aga about this ridiculous design as it would be so simple just to have a spigot with a push and lock type fixing,which my previous wood burning stove had and worked a treat.Apart from the above mentioned very negative comment now the stove is installed I have no regrets buying it and I am sure it will last for many years.